The heat of summer is fully upon us. 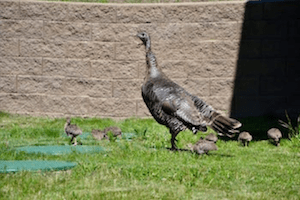 Life abounds, and we rejoice watching the baby turkeys grow up under Momma’s care, reminding us of the kindness of all mother sentient beings. 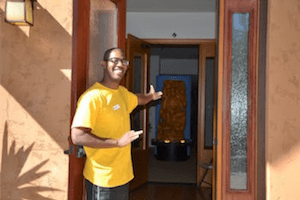 Our summer schedule, too, is rich with the Dharma, with back-to-back courses and plenty of opportunities for study, meditation, and service. Enjoy photos of Abbey life in July here. 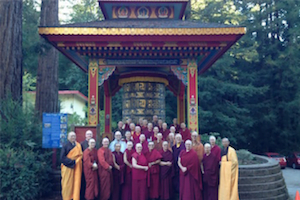 About 50 participants came for our annual week-long deity retreat on 1000-Armed Chenrezig, practicing together with focus and sincerity, and living together harmoniously. See the retreat photos here. The retreat schedule included three or four meditation sessions and two teaching sessions each day, and a discussion group on alternate days. People took the retreat teachings on Nagarjuna’s Letter to a Friend to heart; we will continue with this text next year. Watch the talks here. We were delighted that Tibetan nun Ven. Choyang from Jangchub Choling Nunnery in Mundgod, India, joined us for the retreat and shared in monastic life with us for a week beforehand. We also welcomed Ven. Hanh Thuc, a Vietnamese nun to the retreat. On July 6,the birthday of His Holiness the Dalai Lama, we dedicated our merit especially for His Holiness’s long and healthy life and for us to be his students in this and all future lives. We also recited the prayer he wrote in praise of the 17 Nalanda masters, “Illuminating the Threefold Faith: An Invocation of the Seventeen Great Scholarly Adepts of Glorious Nalanda,” with the aspiration to study and realize the teachings of these wise and compassionate masters of our spiritual lineage. For several years, the Abbey has been blessed to receive teachings from Geshe Yeshe Thabkhe, one of the few remaining geshes who trained in Tibet before the Tibetan diaspora began in 1959. During his four preceding teachings, Geshe Thabkhe taught Aryadeva’s Four Hundred Stanzas. This year he began teaching Chapter Two of Dharmakirti’s Commentary on the “Compendium of Cognition” (Pramanavarttika) , which focuses on the reasoning that establishes the Buddha as a reliable spiritual guide for those who are genuinely seeking liberation and awakening. We weathered on together through this important yet dense and difficult text, being inspired by the Buddha’s qualities. We’ll hopefully continue studying this with Geshela next year. Photos are here. Watch the Pramanavarttika teachings here. Past teachings on Aryadeva’s text are archived here. Ven. Chonyi had a head start on learning the Pramanavarttika when she attended two weeks of the Summer Course at Deer Park Buddhist Center in Madison, Wisconsin, where Ganden Tri Rinpoche Jetsun Lobsang Tenzin taught the text in the mornings and Geshe Sherab gave a review expanding on Rinpoche’s teachings in the afternoons. Ven. Chonyi was grateful for this opportunity, especially considering that the Ganden Tri Rinpoche—who is the head of the Gelugpa tradition—has enormous responsibilities in India, yet still comes to Deer Park to teach American students. Sharing the Dharma Day brought about 60 people together to listen to Ven. Chodron speak on compassion from the book she co-authored with Professor Russell Kolts, An Open-Hearted Life. Watch her talk on the chapter on “Mindful Awareness” here. The day included meditation, a potluck lunch, and discussions in the afternoon. The topic of discussion this month was differentiating genuine compassion from the kind of “compassion” that makes us want to control our dear ones so that they never face difficulties. It was a fruitful sharing of ideas and stimulated many people to ask themselves if, in their wish to “help” others, they actually limited them and hindered their growth. The day after Sharing the Dharma Day was “Chokor Duchen,” the Buddhist holiday that commemorates the day the Buddha gave his first teaching on the four truths. We read the sutra, “The Exposition of the Truths,” that records that event, which succinctly lays out the path to liberation. Photos, combined with Offering Service Saturday pics, are here. When possible, we put Offering Service Saturday and Sharing the Dharma Day (Sunday) on the same weekend, so that people who want to attend both can stay the night at the Abbey. 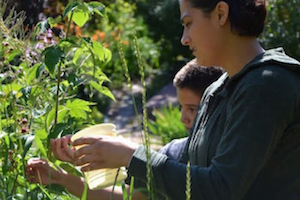 About a dozen guests came on Saturday to help us pick cherries and raspberries, work in the veggie and flower gardens, and the forest. Volunteers also moved lots of already cut firewood out of the forest and our trusty tractor-driver Dave mowed the forest paths, making them very easy to walk on. After a brief meditation at the end of the day, we watched a new video about His Holiness the Dalai Lama entitled, The Last Dalai Lama? This focuses much more on his present life and outstanding contributions to world peace, with just a little speculation about future Dalai Lamas at the end. Ven. Chodron has just begun a new Friday night (or Saturday morning in Singapore) Livestreamed teaching series, Approaching the Buddhist Path . If you’ve ever wanted to “start at the beginning” to understand Buddhism, this is the course for you! 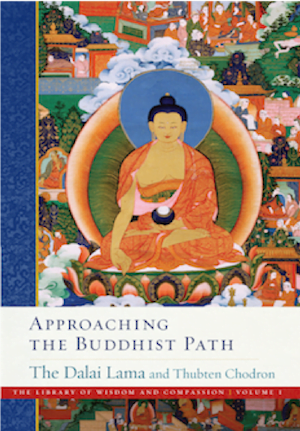 Approaching the Buddhist Path is the first volume in The Library of Wisdom and Compassion, a multi-volume series Ven. Chodron is coauthoring with His Holiness the Dalai Lama. They aim to present the stages of the path to awakening to a Western audience in an accessible way. In last week’s first teaching, Ven. Chodron shared an incredible story of the Tibetan lamas encountering the early Western Buddhist student. She also spoke about the decades of effort that have gone into the publication of The Library of Wisdom and Compassion. You can watch the teaching and future ones to come here. Tune in live here at 6:15 pm PST on Fridays. 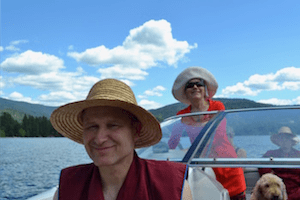 Our friends Doug and Sarah have made an annual ritual of offering a day at their family lake home for the Sravasti Abbey community to rest, relax, and connect with our Dharma friends. This year was no exception, and about half the Abbey community spent a beautiful day at the lake, boating, hiking, and studying in the shade. Before we became too overwhelmed by attachment, we offered the splendor of nature and the delicious food prepared by all our friends to the Three Jewels! We rejoice at Doug and Sarah’s generosity and care for our community that manifests in so many ways. Photos are here. Ven. Chodron returned to the Gardenia Center in Sandpoint, Idaho, to speak at their Sunday Service. The theme of the service was wisdom, so Ven. Chodron spoke on the two types of wisdom in Buddhist practice and how they help us to develop love and compassion. Watch the talk here. We were delighted to see not only friends from Sandpoint, but also the Spokane area, in the audience, demonstrating a growing interest in Buddhism and spirituality in our region. Vens. 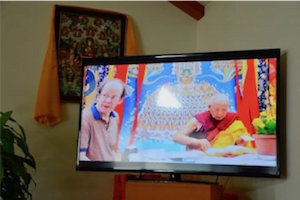 Tarpa and Losang continue their regular visits to Airway Heights Correctional Center to share the Dharma with the Buddhist group, the Gateless Sangha. They have been teaching on Good Karma: How to Create the Causes of Happiness and Avoid the Causes of Suffering by Ven. Chodron, which makes for rich discussions afterwards on karma and purification. The venerables clarified how karma is not predestined and highlighted the role of purifying past harms so as not to experience future suffering results. Vens. Samten and Tsultrim went to the Walla Walla Penitentiary to join two different inmate groups for their annual “Buddha Day.” In spite of the imposing, bleak compound with tall walls rimmed with coils of barbed wire, the two monastics were surprised to meet men who were smiling, eager to connect, and curious to know more about Buddhism. The nuns led a guided meditation, talk, and Q&A session for both groups, who listened attentively to the teachings on the potential of the mind and how it can be transformed. One inmate shared how he was inspired by research that showed that meditation lowers the rate of re-offending and rejoiced that he had found a practice that would benefit him for the rest of his life. Read the details and watch Ven. Samten’s talk about the prison visit here. 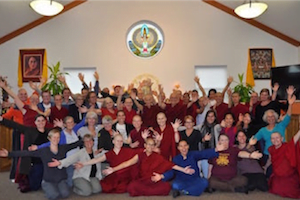 “We need to raise $3,000 to support the travel expenses of nuns and monks participating in this year’s 24th Annual Western Buddhist Monastic Gathering, to be held at Spirit Rock Meditation Center in California. “Buddhist monastics in America are often running Dharma centers, isolated from other monastics. Or they may have a strong monastic community but little access to other Buddhist traditions. 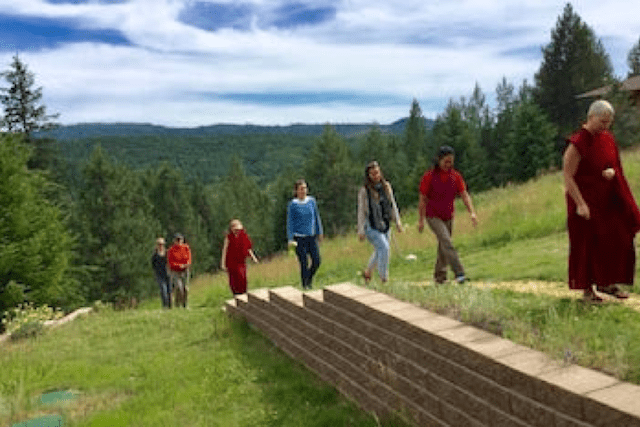 This gathering allows monastics from all Buddhist traditions to meet together in a supportive environment, where we can learn from each other and deepen our spiritual practice connections. Thanks to generous sponsors and volunteers, we have a new iMac for video editing and a new group of online video editors! In addition to videos of ongoing teachings, look out for teachings from our archives such as these videos on the Essence of Refined Gold recorded in 2008. One of Ven. Chodron’s old friends, Dr. Tenzin Dorjee, was appointed by Congresswoman Nancy Pelosi to sit as the first Buddhist on the US Commission on International Religious Freedom, which has sent him on recent field visits to Burma and Iraq. When they met in India back in the 1970s, Tenzin Dorjee was a monk-translator at the Library of Tibetan Works and Archives. He is now a Communication Studies professor at Cal State University, Fullerton. The Trump administration just added three evangelical Christians to the Commission, but Tenzin was unanimously elected as the Chair for his second term on the Commission. Here is the official press release.